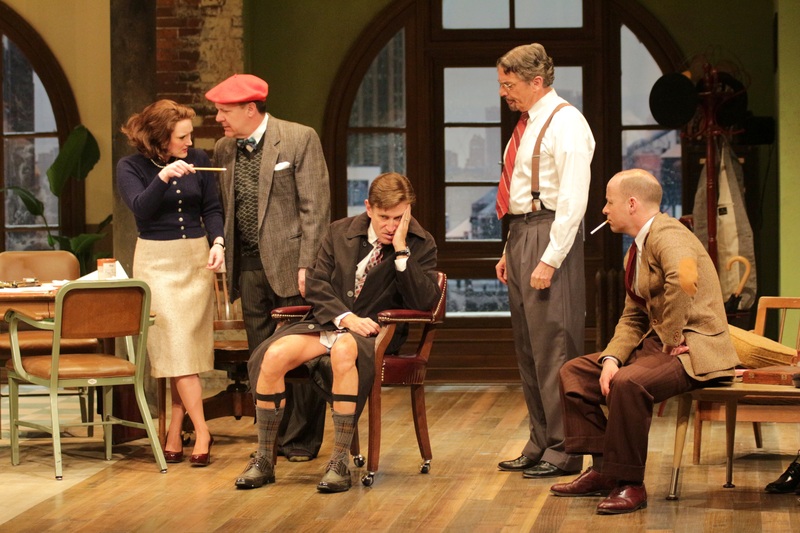 Timing is the essence of comedy, and timing, coupled with characterization, makes Keith Baker’s production of Neil Simon’s “Laughter on the 23rd Floor” at Bristol Riverside Theatre a congenial success that never misses a laugh and earns yuks and guffaws legitimately. Baker is abetted by a ready cast that has fun with their material while keeping things, mostly, to human scale. The actor who sets the rhythm for “Laughter’s” flawless tempo is Bruce Graham, who is usually billed around these parts as a playwright. Any snarky jokes about day jobs go out the twenty-third story window when you hear Graham’s deft way with a line, see the way his character sets Baker’s production in motion, and admire how he takes one of Simon’s minor characters and makes him solidly integral to all the mayhem and tummeling that fills Jason Simms’s magnificent true-to-life set complete with Palladian windows and plaster that can be punched through whenever anger needs relieving. Among Baker’s cast, the only one called upon to do shtick is Benjamin Lloyd as a hypochondriac whose comic genius saves him from being pilloried by his co-workers and sacked by his boss, the estimable Max Prince, star of one of the seminal and most constantly current and witty variety shows in the history of television. Lloyd is the perfect actor to affect the walk he makes hilarious and other nonsense. A fine actor, he does all in the total context of his character, Ira, allegedly modeled after Mel Brooks. In what I think is a tribute to Brooks and “Blazing Saddles,” Simon even gives Ira a fart joke, which Lloyd perpetrates with aplomb (but no sound effect; excellent!). Graham also has some physical moments when he has to keep Max Prince from seeing he is wearing a suit Max will supposedly detest to the point of flying into a wild plaster-threatening rage and Graham’s character, Milt, does a kind of fan dance with sections of a broadsheet newspaper to hide his outfit. 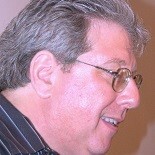 If you didn’t know already, the mention of Max Prince and Mel Brooks may have told you “Laughter on the 23rd Floor” is Simon’s play about his nascent days as a comedy writer, the youngest and newest member of the team that wrote ‘Your Show of Shows” and produced now-classic material for the program’s star, the recently deceased Sid Caesar. The great thing about Baker’s production is you don’t have to know a thing about Caesar or “Your Show of Shows” to appreciate or revel in what happens on the Bristol stage. For once, Simon’s play speaks for itself. Baker’s is about the seventh production I’ve seen of “Laughter on the 23rd Floor,” including the Broadway original with Nathan Lane as Max, and his is the first production I’ve liked and found consistently funny and entertaining. Being aware of Caesar, his writers, and their monumental contribution to television and comedy colors the experience and makes for a fine guessing game about which character relates to which actual writer, but it doesn’t make Baker’s production any richer or more satisfying. The pacing and the deft playing by a sharp, pinpoint cast brings Simon’s writers’ room to life and shows the genius and eccentricity in the funny men and one woman, one pregnant woman, who reside there. The Bristol company is to be congratulated on a brilliant effort, and Simon is to be congratulated because twice within a month, two local theaters have played his work to the utmost and allowed audiences to see why Simon earns a high place in the annals of theater, play structure, and flat-out assured comedy. “Laughter on the 23rd Floor” joins Act II’s “Hotel Suite” at showing Simon at his best and most playable. Both productions knew how to take the schmaltz and set-up lines and make them human and funnier because they seemed to spring from a character’s imagination instead of a gag writer’s pen. The Encores production of Simon’s “Little Me” in New York reinforces the playwright’s status as a man who can be funny but move a plot along and give actors something substantial to play. It’s gratifying to see Simon brought to the stage so deftly. Too often, actors just mug and bark the jokes. No such thing on Baker’s stage. Even Lloyd, whose character gives him license to cross boundaries into performing as much as acting, creates Ira in way that keeps him believable and acceptable. Every actor on the Bristol stage has a moment that displays his or her character’s knack for unbridled humor and his or her individual talent for comic acting. Graham and Lloyd lead the way, but Carl Wallnau is marvelous as the Val, the head writer who is a Russian ex-pat and has the Ashkenazi aptitude for making ironic comics and putting a dark or ominous spin on any situation; Kenneth Boys brings reasoned deadpan into the room as Kenny, the most outwardly normal of the writing crew; Megan McDermott is sterling as the lone woman on the writing staff, especially when she goes into her character’s riff about how she had to give up womanhood to survive among her zany male colleagues and the language adjustments she had to make to do it; and George Deihl makes hay out of his character’s luck to be the only goy on the premises. Well, like Simon, we all know the Irish have a way with a joke and a story as well. The glory in Bristol is how well “Laughter” moves even when nothing of substance is happening. The sequences in which the writers are showing off or ragging each other for the sport of it are as humorous and engaging as the scenes in which a matter of consequence, such as NBC management fiddling with the comic content of the Prince program, a McCarthyish threat, or the fate of one or all of the writers becomes gloomy. Baker has marshalled his cast into being an ensemble. Each supports the other, Graham setting the tone and others, as they enter the stage, following in kind and upping the comic ante. One of Simon’s points is how Max Prince, unlike most television hosts, sat in with the writers and took a personal interest in the composition and playability of sketches. David Edwards, as Prince, is remarkable because he both galvanizes scenes as a focal character and blends in so well with the rest of the company. Edwards manages to stand out while avoiding a star turn. He keeps Max real even though everything we hear about him makes him seem larger than life and twice as crazy. Easy conversation, communication, and hacking around with each other drives the Bristol production. Scenes that stress one character, or give Edwards or Lloyd some extraordinary business , seem organic and natural even when acted broadly. Bristol’s “Laughter” flows and seems all of a piece. You feel as if you’re witnessing day in a rather raucous office instead of a play that Simon loaded with set pieces and moments of orchestrated tumult. Jason Silverman is youthfully eager and has some fine moments as Lucas, the Simon surrogate, who joins Prince’s made crew towards the end of their TV reign. The actor is also saddled with narration Simon would have done better to have incorporated into his script they he so deftly slips bits of exposition through the early scenes when Graham, Wallnau, Boys, and Deihl are doing random tummeling that works like a charm. A comic charm. Baker’s “Laughter on the 23rd Floor” is a great achievement. It proved what a fine play Simon wrote. Bristol’s production changed my mind about it completely, and I’m glad it did. Remember, in theater, the play is certainly an important part of a production, but the production is what matters. I am grateful for his new and fresh look at “Laughter on the 23rd Floor” and even more grateful to Edwards, Graham, Boys, McDermott, Wallnau, Lloyd, Deihl, Silverman, and DelMarcelle for bringing to such vivid and vibrant life. In addition to the perfection of Jason Simm’s set, a double office painted different colors on each side of a support beam and crammed with wooden chairs on casters around a solid writing table with desk, typewriter, and telephone in the background, the costumes by Gina Andreoli were both witty and appropriate to TV folks in the ’50s. I particularly like the too-small suit Andreoli has Graham’s character change into when he wants to preclude Max’s wrath over his original outfit, and a great ’50s midnight blue dress DelMarcelle wears to a Christmas party. “Laughter on the 23rd Floor,” runs through Sunday, April 13 at the Bristol Riverside Theatre, 120 Radcliffe Street, in Bristol, Pa. Showtimes are 7:30 p.m. Wednesday and Thursday, 8 p.m. Friday and Saturday, 2 p.m. Wednesday and Saturday, and 3 p.m. Sunday. Tickets range from $46 to $36 and can be obtained by calling 215-785-0100 or going online to www.brtstage.org. This entry was posted on March 22, 2014 by nzoren in Theater Reviews and tagged Benjamin Lloyd, Bristol Riverside Theatre, Bruce Graham, Carl Wallnau, Comedy, George Deihl, Gina Andreoli, Jason Silverman, Jason Simms, K.O. DelMarcelle, Keith Baker, Kenneth Boys, Laughter on the 23rd Floor, Megan McDermott, Neil Simon.